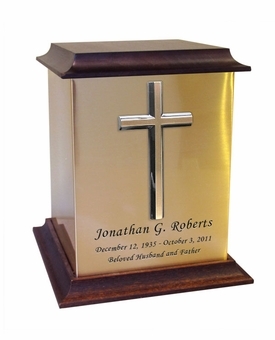 This beautiful Bronze Cross Sheet Bronze With Walnut Trim Snap-Top Cremation Urn is fabricated in .016 sheet bronze and trimmed in solid walnut. 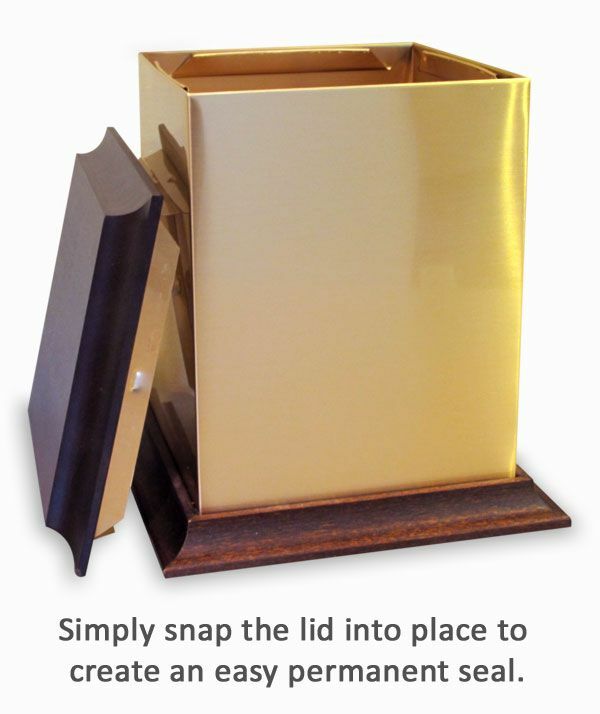 Each urn features a snap-top locking lid, eliminating the need for soldering to obtain permanent closure. Once the lid is snapped into place, it is sealed permanently. Opens with a snap-top locking lid, eliminating the need for soldering to obtain permanent closure. Once the lid is snapped into place, it is sealed permanently. Personalized, usually ships in 1-2 business days after the proof is approved. The Bronze urn with the Marine Corp emblem is just beautiful. I'm so glad that I chose it. I know my loved one is resting peacefully in this beautiful urn. Thank you Mainely Urns. I will definitely recommend you to anyone that is in need of a beautiful and affordable urn for their loved one. ProsIt's beautiful and is honoring my loved ones Military Service. Very happy with it. This urn is beautiful, just as my family had hoped to commemorate a loved-one. Customer service was excellent. ConsNone come to mind. This is the first/only urn I have bought. Marine urn very appropriate for veteran's remains. The marine insignia very nice, urn solid construction and very pretty. Very good price, inscription done well. Came in mail very close to ordering date. From the moment I opened the shipping box, until the moment we placed the urn into the ground, we found this urn a thing of beauty and a beautiful resting place for my husband's ashes. The quality and attention to detail was beyond reproach. This is someplace that I am sure my husband would be proud to have his remains resting. ConsLength of time it took to get to me. We got it the day before the services. I found the urn to be extremely nice. I lost my husband at a young age and he was a marine until he died. I had him cremated and it was fitting to put his ashes in the correct place. After opening the box, I noticed a plastic bag with a tie. Scratching my head, I figured out this is what the ashes are placed in before placement in the urn (probably due to the construction of the urn). I recommend a quick "How To" instruction sheet for urns of this type. Excellent work, very well done, very classy. The work was beautifully done, I'm very happy with it. Excellent product and customer service. Priority shipping was expensive, but my fault for waiting to order until I HAD to have it, but customer service followed up to be sure it had arrived as needed. THANK YOU for caring. ConsOvernight fee was a lot, but it was my fault for waiting too long to order it. So impressed with your work. The design & construction are top notch. The emblem looks fantastic. Price made this urn exceptional! It's a very good looking urn that I know my father would be proud of. The service was great and efficient. ProsThe urn is very classy and well made. Great customer service. 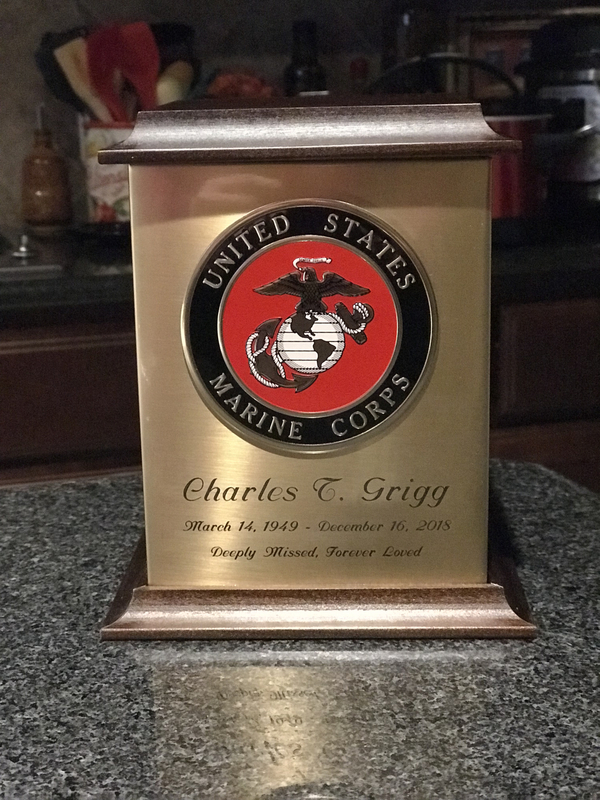 We received this urn promptly for my dad's service and it was just what he would have wanted. The quality is great and we loved that the emblem added color. I didn't have engraving done because of the time frame, but it looks great without it. My favorite Captain would be proud. I was very impressed by the personal and prompt service upon contacting Mainely Urns after finding them in a Google search. Just as promised delivery and product quality. We were very pleased. Arrived very quickly and nice product. This urn was perfect. Easily ordered without complications and was done really fast and shipped on time. The cemetery my where my parents cremains will rest has very specific size guidelines so that their urns will fit in their niche. Finding an urn that fit was a bit challenging, but Mainely Urns had exactly what we needed! 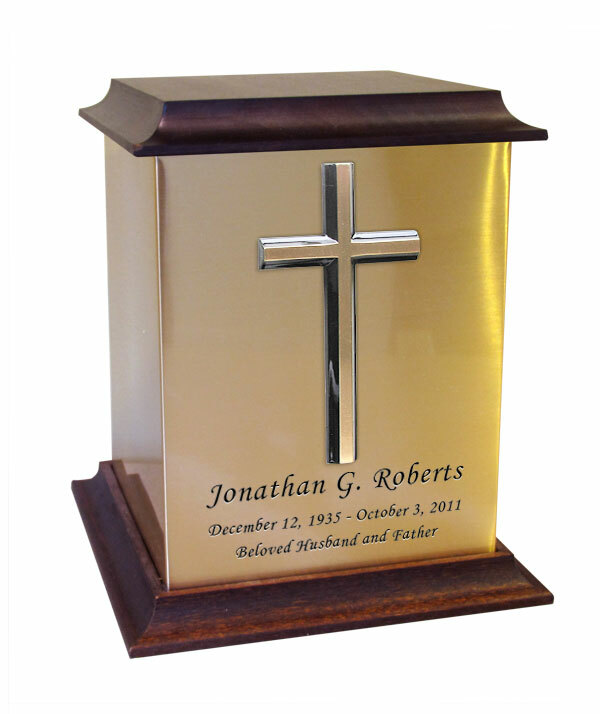 Not only do they offer a wide selection, but the quality of the bronze urn we chose is impressive. Their customer service is excellent as well; they sent me a proof of the engraving we requested and did a beautiful job! The urn arrived quickly, and we are very pleased. It was a pleasure dealing with Mainely Urns. Urn was exactly as pictured and described on website. Very pleased with the product, delivery and very attentive and understanding staff. The two urns that I purchased are very beautiful and are accurately described on the Mainely Urns website. My only concern is that the sheet bronze is quite thin and may scratch easily. Otherwise, the product is most satisfactory. Very fast delivery excellent quality. Very good quality and perfect for its purpose. The urn was beautifully done and my family was very satisfied with the way it turned out. 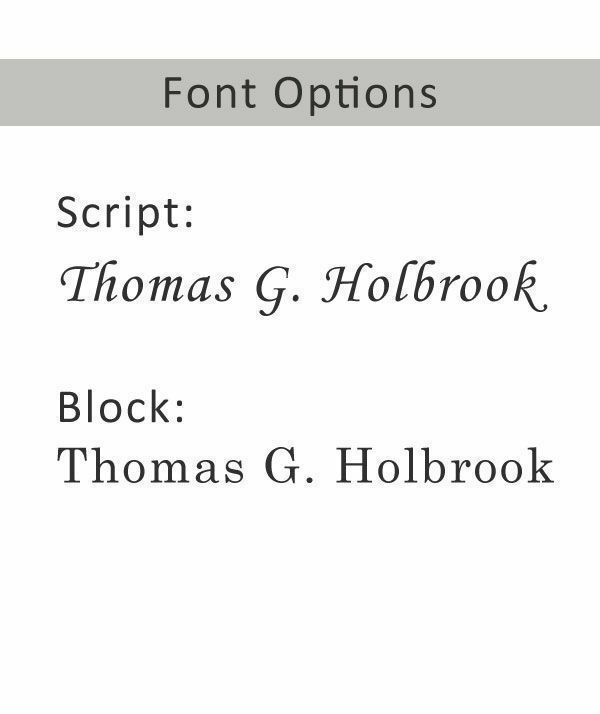 A well planned and laid out website facilitated the decision on the type of urn we needed for our beloved Mom's final resting place. This is very much appreciated. A fine quality product that is just what we needed. We had a specific niche size for an urn to fit into and this one was perfect. It looked great and was good quality. We also needed it quickly and were so grateful that the delivery was exactly as promised. Very impressed at a very difficult time for our family. Thank you Mainely Urns. I needed a specific size urn to fit into a niche at our cemetery. I had tried ordering an urn from somewhere else and the service was terrible. Last minute I contacted Mainlely Urns. They were polite and very helpful. I had an order confirmation before I got off the phone A proof and shipment within 24 hours. I would highly recommend them for their professionalism and prompt service and reasonable pricing.